Q: Do we get enough sun in my area? A: Western Pennsylvania and the surrounding region gets more than enough sunshine to make solar power a viable option. In 2007 Pittsburgh, PA was named one of the Solar America Initiative Cities. It’s global location (longitude and latitude), elevation and other factors determine the amount of sun in a given area and the production capacity, and this region’s average 4.5 daily hours of sunshine easily sustains a solar system’s energy requirements. 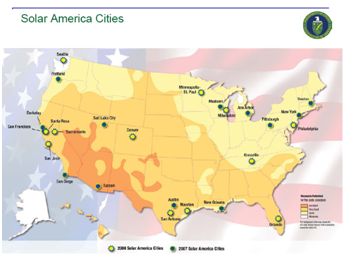 For more information about the Solar America Cities, visit the U.S. Department of Energy at http://www1.eere.energy.gov/solar/solar_america/about.html. Q: Which structures are suitable? A: While many structures are suitable for solar power, Underwood Solar Future focuses on rooftop installations for small commercial buildings and multi-unit residential dwellings. Q: Where does the system mount? A: Your solar panel system can be mounted almost anywhere that permits access to sunlight. An installation facing south or southwest provides optimum benefits. A weight calculation is required by a registered architect or professional engineer to ensure that a rooftop can support the equipment safely. While this typically does not present a problem, it is a critical step. Q: Do all panels generate the same power? A: Your property’s physical location to shade, trees, taller buildings, or valleys can impact the amount of sunlight that your solar panel system will receive each day. These considerations are made in the evaluation. Q: How much space will I need and how big will my system be? A: The size of a solar panel system will vary depending upon the amount of electricity required. The amount of space needed correlates directly to how much electricity you want to produce. You can choose to produce a percentage of your electrical power needs or create a system that totally eliminates your current bill. Your current demand can be found on your electric bill. Q: Will I have to do maintenance to my system? A: Occasionally washing the panels is recommended but the solar panel system is virtually maintenance free. The panels have a 25-year warranty from the manufacturer, and the other components have a minimum warranty of 5 years, which can be extended to 20 years. Q: Does the system include batteries? A: It’s your choice. It can! Q: How much will my system cost? A: Cost varies depending on the size of the system selected and the required installation to achieve optimal results for your property’s needs and site characteristics. Each system is different and must be custom designed. Q: Can I make money off building a system? A: Every situation is different, but if you have a large enough area to place your solar panel system, you can usually generate enough power to exceed your own demand, and thus make money. Q: How long will it take to produce electricity? A: After the system is installed (usually in a few days) it will be producing electricity soon after all inspections have been completed. Q: How long has solar power been around? A: Photovoltaics, as we use them today, were first discovered in the US in 1873. Usage in space technology and other commercial applications has led to significant increases in efficiency and have resulted in the residential and commercial applications used today.